John Sweeney is a madman. You can trace his gonzo form of emotional outburst-based documentary film-making directly from fellow English crazy person Nick Broomfield. Both charge headfirst into fraught situations without consideration for the consequences. In the meantime they often gather amazing footage and admissions by their interview subjects. It somehow seems almost accidental that they came across this information. He apologizes over and over for losing it here, but he does manage to get a ex-Scientology spokesperson Mike Rinder to admit that he was goaded into having this reaction. He further admits that Sweeney and his crew were followed during the last production. Beyond that, the rest of what's here is a pretty one-sided conclusion that Scientology is a cult, a claim that is pretty hard to refute given the available evidence. Still, there's really no question about what conclusion Sweeney is going to arrive at by the end of the proceedings when he asks rhetorically whether it's a benevolent organization or something more sinister. The celebrity interviews that are shown via the Scientology response to the first documentary were barred from appearing in the original. Kirstie Alley, Juliette Lewis and others lash out violently when questioned about their faith. 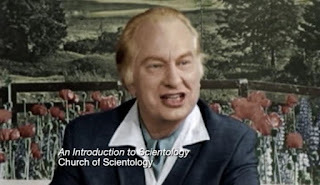 They get especially prickly when the subject of Xenu and the Scientology creation myth are brought up. The stars publicly deny this teaching, which makes sense since apparently it isn't revealed to the participants what they're in for until they've invested a significant amount of time and money. Other former members say this is not acknowledged to outsiders because the information would literally kill them. Heady stuff. "Cult" is a charged term that's not easy to define. Sweeney believes this fully and the point here isn't to have him go on a journey from one opinion to other. This is as biased in this direction as any production from Scientology would be from the other. He has an agenda. Based on what he uncovers I don't think he's necessarily wrong. His closing argument is to interview family members that have been ripped away from their kin after leaving the confines of the church. And that does sound a bit cult-y.